After a 3 year hiatus, I went to yoga tonight, so Steve cooked dinner all by himself. 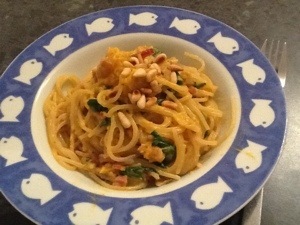 It’s a Jamie Oliver pasta dish with pumpkin, bacon, spinach, pine nuts and probably other things. By the way, I made it through my yoga class better than I thought, but I think I’m gonna feel it tomorrow….